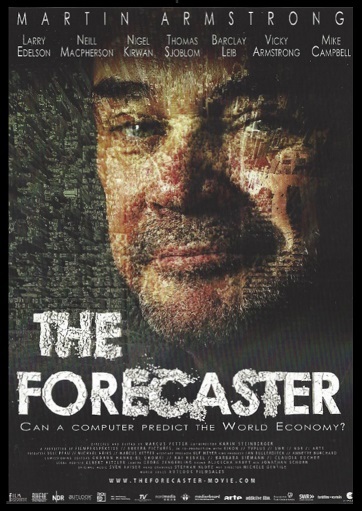 QUESTION: Mr. Armstrong; I watched the film the Forecaster. I then read your plea. You simply said you failed to tell your clients that the bank took the money. How is that a crime? Then the bank pleads guilty, has to return the money, and you have no restitution. This all makes no sense. ANSWER: Oh it gets better. First, you have to understand for them to do such a movie, they have to get insurance to cover any lawsuit claims. Everything in that movie had to be presented to Lyods of London to prove that all statements could be proven in a court in order to even get such insurance. They had to investigate the claims in detail on both sides or such a film would never be made. It was funded by the German TV station. When it became clear that the receiver was trying to paint me as a rogue trader who conspired with the bank’s own people against my own clients, that would have allowed the bank to keep all the money. So I did an interview with the Japanese press and told all my clients to come to New York and file suits against the bank. They did. I met with their lead lawyer and I agreed to help them and testify against the bank. The bankers ran to the government and they escorted them into my case and placed a lifetime gag order on me to prevent me from helping my clients against the bankers. No lawyer I know of has EVER heard of such a gag order. 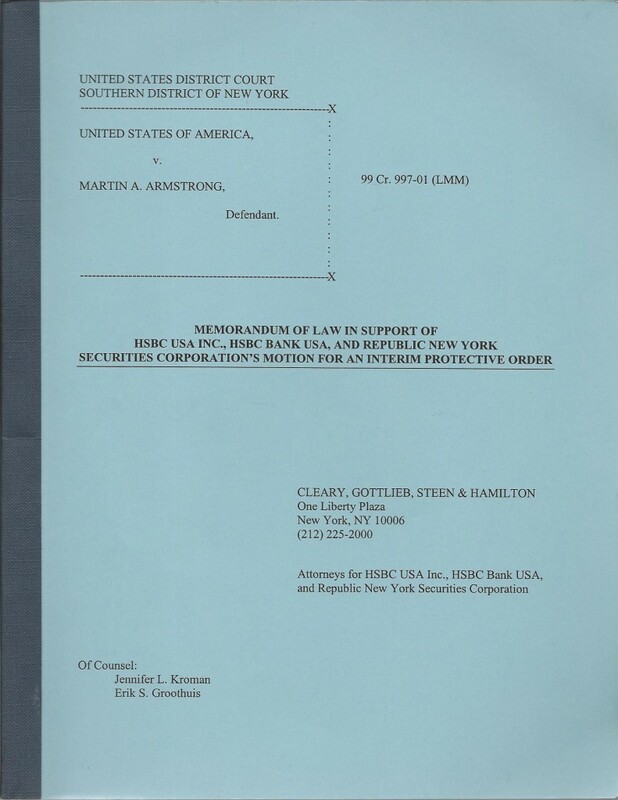 This single action demonstrates that there is no rule of law in New York and you will NEVER win a lawsuit against a New York bank – PERIOD!!!!!!!!!!!!!!!!! It is true that because I got my clients to file suits against the bank, there was no choice. My clients were public corporations and institutions – not individuals. They had the resources to go all the way. The bank had to return the money and walked away without even a fine. Republic/HSBC pleaded guilty and had to pay $640 million because they simply took the money. Because you have careers at stake who filed complaints without any investigation to protect the bankers, then it becomes all about covering everything up. The interesting thing is that the notes were in Japanese yen, not dollars. They called it $1 billion fraud and never understood the currency issue. When they did, they protected the bank by selling our notes to the bank to let them take our profits which were $400 million. Republic/HSBC pleads guilty to $700 million at the beginning. The head prosecutor Richard D. Owens explains to the court on January 9th, 2002 that in truth the notes were in Japanese yen not dollars and now Republic only needs to pay $650 million but the yen remained the same. Then 30 days later, the yen declined further and now it was $606 million. Owens handed HSBC $400 million in our profits to the bank and the courts all looked the other way. As for my plea, they would not drop the charges and Richard Owens said to my face he knew I did not take any money. Obvious! You either write a check or you wire it out. You cannot yet beam it out like Star Trek. They would not drop the charges so the compromise was I was given a script to read like any hostage held by terrorists. So the compromise was that I failed to tell my clients that the bank took the money on a Friday and went to my lawyer Monday morning to file a lawsuit. Of course, we have more than 100 institutions and they were not individuals you could call at a home on a weekend. But reality and truth have nothing to do with anything.